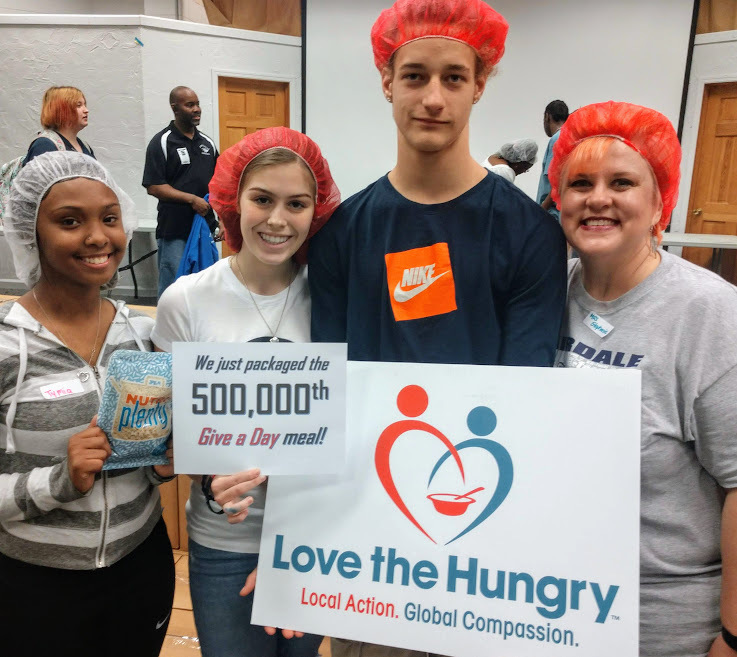 Student volunteers at Fairdale High School packaged more than 17,000 Nutri-Plenty meals during their second annual “Fairdale Feeds The World” service project. Students helped coordinate the event from start to finish, including fundraising, set up, meal packaging, and clean up. A milestone was reached during the packaging session as the 500,000th “Give A Day” meal was produced. Each year during the month of April, Louisville dedicates a week of service to engage volunteers in acts of compassion. Since 2012, Love the Hungry has been a partner in the annual event. Fairdale HS volunteers celebrate 500,000 “Give A Day” meals packaged since 2012. More than 700,000 people have been impacted by disastrous flooding in Malawi, prompting a first-of-its-kind response from three local nonprofits. 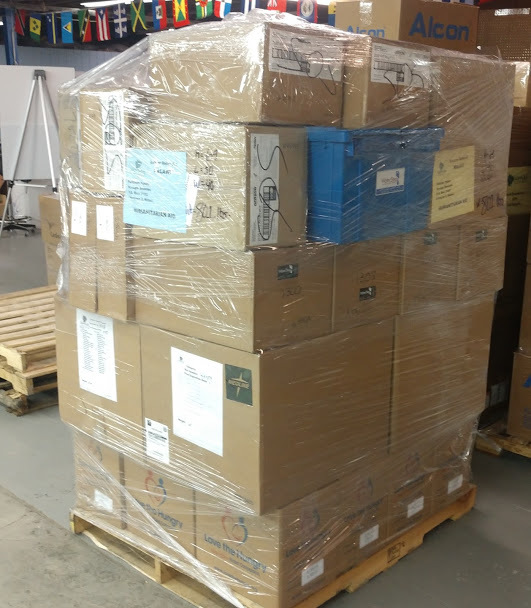 Supplies Over Seas, WaterStep, and Love the Hungry have teamed up to provide a “First Reponse” pallet of health aid that is being flown to the disaster site. It includes first aid medical supplies, clean water technology, and enough fortified Nutri-Plenty® servings to feed 150 children for two weeks. The donated supplies are valued at more than $16,000 and will be received by Kasupe Ministries of Malawi. Shipping costs have been covered by the Greater Louisville Medical Foundation and the family of Martha Harding. Medical supplies, clean water technology, and fortified meals will provide emergency health aid to the survivors of disastrous flooding in Malawi. 970 volunteers participated in seven packaging events during the month of March – producing 136,878 Nutri-Plenty® servings. Our thanks to groups from Bellarmine University, Ewing Elementary School, First Baptist Church (Grayson, KY), GPNA Neighborhood Association, Kentuckiana Association of UCC Churches, Prichard Elementary School, SECC Small Group, Shelby Christian Church, Shelbyville Rotary Club, and St. Michael’s Catholic Parish. A significant amount of humanitarian aid was shipped during the month, including a container shipment (250,000+ meals and other supplies) to South Sudan, two pallets of fortified meals to Haiti, and a “First Response” shipment of aid to Malawi. Prichard Elementary 4th Graders celebrate the 6,000,000th fortified meal. 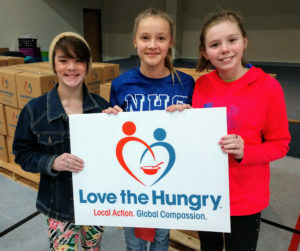 2019 is off to a great start as more than 1,000 volunteers of all ages have participated in Love the Hungry packaging sessions. Churches, synagogues, schools, community organizations, and corporate teams have stepped up to take action to end hunger. Each fortified meal will provide nourishment and hope to children and families suffering from chronic hunger. During the first quarter of 2019, humanitarian aid is being delivered to Eastern Europe, Guatemala, Haiti, and South Sudan. Employees from throughout the country gathered in Louisville, KY for GE Appliances annual “Big Event” leadership conference and engaged in four one-hour Love the Hungry packaging sessions. 370 volunteers participated in the service project – producing 88,080 Nutri-Plenty® servings. The fortified meals will be included in upcoming shipments to Guatemala, South Sudan, and other locations. GE Appliances also reached a significant milestone, surpassing 200,000 total meals packaged in partnership with Love the Hungry. Each month, Love the Hungry designates a Saturday for individuals and small groups to participate in a packaging session. It’s a great opportunity for students, families, local business teams, and other groups to join together for a fun and meaningful service event. Individuals and families are welcome, or you can recruit 10 – 12 volunteers to fill a complete packaging line. Volunteers as young as six years may participate with adult supervision. A suggested donation of $25 per person helps offset the cost of packaging supplies and delivery. All small group sessions take place at the LTH Packaging Center, 4209 Gardiner View Avenue. To learn more or to register, please phone 502-459-9199. Record-Setting Start to New Year! 820 volunteers participated in packaging events during the month of January – producing 161,842 Nutri-Plenty® servings! It’s the highest January total in program history. The events included two MLK Day service projects. 140 volunteers of all ages gathered at two Martin Luther King, Jr. Day service projects and took action to end hunger. For the eighth consecutive year, Bardstown Rotary Club and local high school volunteers mobilized at Bethlehem High School, packaging 21,624 Nutri-Plenty servings. The Temple (Louisville, KY) also hosted an inter-faith event where volunteers produced 10,848 fortified meals. 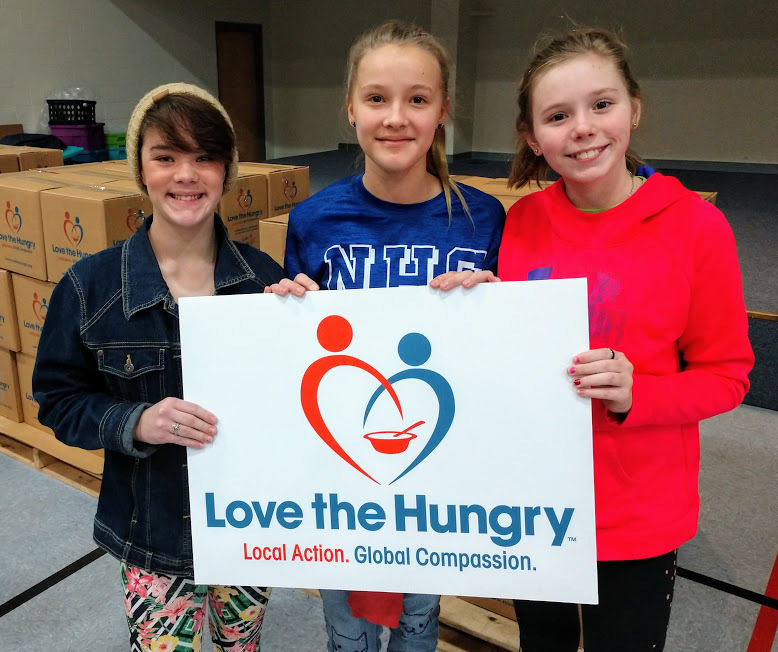 Love the Hungry is preparing humanitarian aid shipments for Guatemala, South Sudan, and Eastern Europe during the first quarter of 2019. Since 2012, more than 210,000 fortified meals have been produced during MLK Day service projects. To learn more about how your group can host a Love the Hungry event, phone 502-459-9199. Every Nutri-Plenty® serving provides nourishment and hope to children and families most vulnerable to chronic hunger. Thank you for making 2018 another meaningful year! Donate Today. Help Complete the Mission. The mission isn’t complete until the children are fed. It’s been a great year! 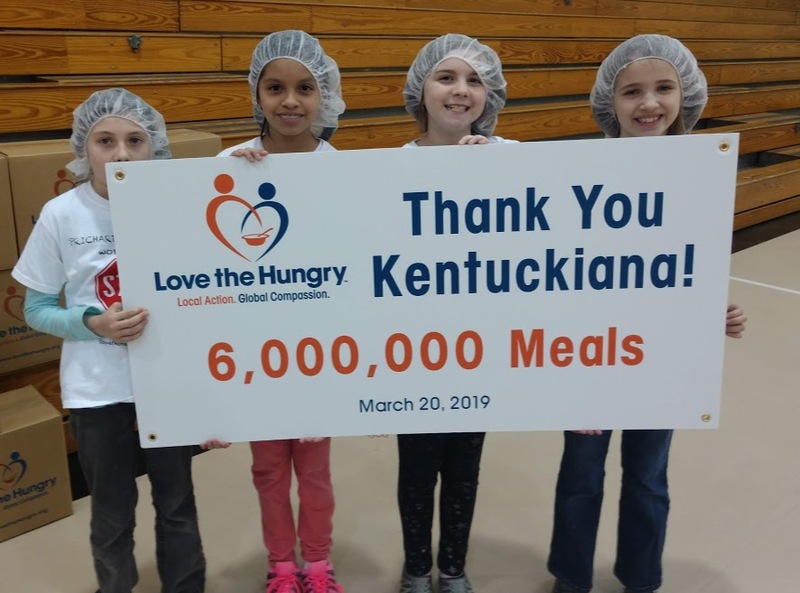 More than 4,800 volunteers of all ages have participated in Love the Hungry packaging sessions – producing 800,000+ fortified Nutri-Plenty servings. Every meal provides nourishment and hope to children and families that are most vulnerable to hunger. However, the ongoing humanitarian mission in South Sudan is in crisis. Supplies have been depleted and 900 orphaned children are at risk of no longer receiving the daily meals that provide the essential nutrients needed for better health. A nine-month supply of Nutri-Plenty servings is ready to be shipped, but additional funding of $10,000 is needed to offset the shipping costs and expedite delivery. Will you help complete the mission with a year-end donation? Your gift will directly benefit this special appeal and ensure that the mission in South Sudan is fulfilled. The need is urgent, and we ask for your prayerful consideration.